IIICCCCHHHHIIIIIRROOOOOO, as known in some miniscule speech therapy needing parts of the Yankee's ballpark. I wasn't in the mood for a fly ball. I thought 'Don't come here! Don't hit it here! ', and sure enough, because my willpower wasn't strong enough, he hit it to me. I then sent mental signals to the ball saying 'don't come near me; land somewhere else' but the mental signals didn't work and it landed right in front of me. The Yankees decided that a World Series wasn't enough; they needed to steal and beat the cra[bs] out of the other teams. 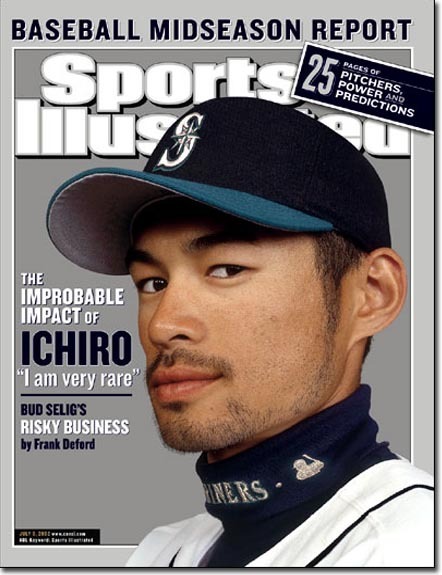 So they went out and traded for Ichiro. Police suspect foul play; they found chlorofoam in an alley only 200 miles away from the Mariner's General Manager. But, in a sign of respect, Ichiro bowed to the cheering Mariner fans during his first game with the Yankees. Some say the last time a Yankee has bowed so deeply to Mariners fans, was when A-Roid took a purpose pitch to the cup.